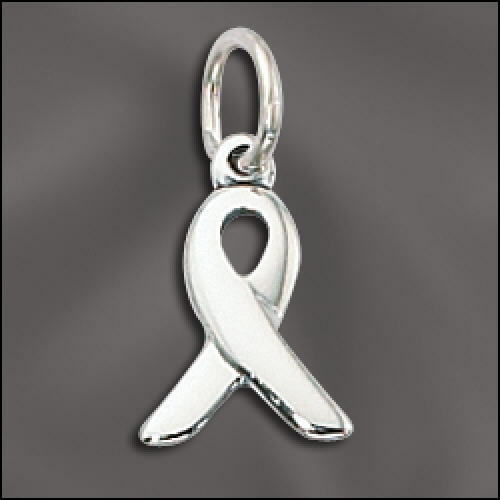 You’ve probably noticed that many people are wearing “awareness” jewelry these days. 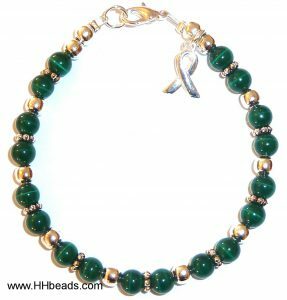 The jewelry is often an awareness bracelet, though it is sometimes a necklace, lanyard, or other type of jewelry. You may have noticed how many different colors there are, though you know it’s awareness jewelry because of the ribbon, which has become the universal symbol for awareness campaigns. Perhaps you’ve wondered why so many different colors, or what they mean, or even where the ribbon came from? 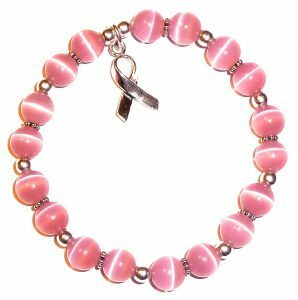 In cancer awareness bracelets, as well as in other types of awareness jewelry, each color stands for a specific kind of cancer. The ribbon has been used as a symbol of awareness and support for various causes since 1979, when the wife of one of the men held hostage in the Iran crisis used a yellow ribbon as a show of support for her husband and the other prisoners. Then in 1989 an activist group used the ribbon to raise awareness for AIDS during the Tony Awards. Soon, every cause and charity organization had to have one. And the “awareness ribbon” was born. 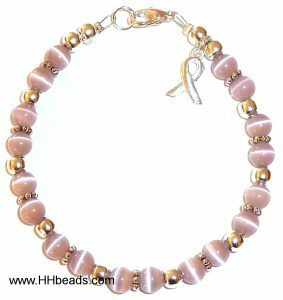 Breast Cancer Awareness Bracelet – 6m cat’s eye beads. Originally, the awareness ribbon that was used for breast cancer awareness was peach. It was introduced by a woman named Charlotte Hayley, and was passed out in an attempt to get congress to allot more money to cancer research. In 1992, Self Magazine editor Alexandra Penney reached out to Mrs. Hayley, and tried to use the peach ribbon as a part of Self Magazine’s Breast Cancer Awareness initiative. But Mrs. Hayley rejected the idea as too comercial, so the magazine changed the color of the ribbon to pink, to avoid legal conflicts. The pink ribbon was incorporated by the Susan G. Komen foundation, as a part of what they gave their Race For The Cure runners to wear. They had already been handing out pink visors, as a part of their racing gear, so the pink ribbon was a natural extension for them. Over time, pink became the universal color of breast cancer awareness. 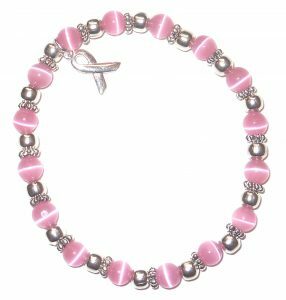 We offer several beautiful breast cancer awareness bracelets, in silver plated and sterling silver accents. 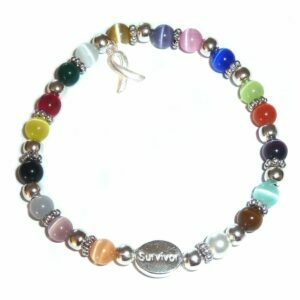 Survivor Cancer Awareness Bracelet – Colors represent the different types of cancer awareness. 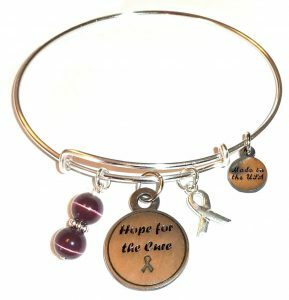 Cancer Awareness Bracelet on stretch cord – made to fit most size wrists. Men’s Cancer Awareness Bracelet – Made with 8mm Cat’s Eye Beads and square hematite. Rugged and supportive, just like him. 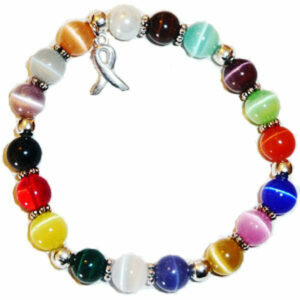 These multicolor cancer awareness bracelets are made from fiber optic cat’s eye beads and silver plated accents. 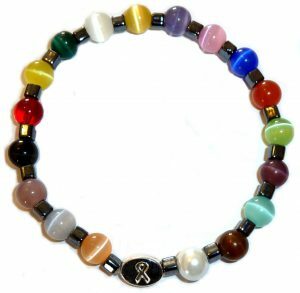 Each color represents a different kind of cancer, which makes them ideal for all cancer awareness events and fundraisers. Each bracelet comes packaged individually, with a card that explains the different colors and the cancer’s that they represent. Bracelets with wires and clasps are very strong, made to stand the test of time. Each bracelet is approximately 7 1/4 ” long, which will fit most wrists. 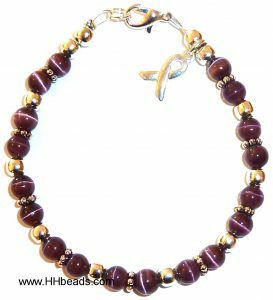 Bracelets made with stretch cord, however, are super easy to take on and off, making them ideal for some people. They also stretch to fit a variety of sizes, making them more universal for some audiences. 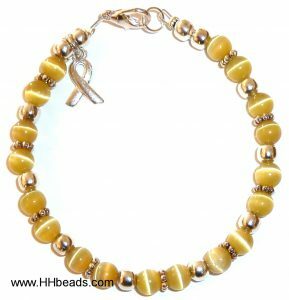 Melanoma Awareness Bracelet – Cancer Awareness Bracelet in black cat’s eye beads for melanoma. 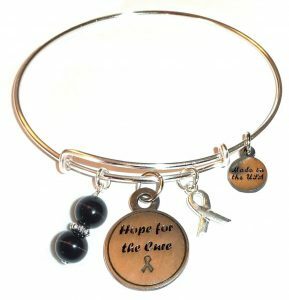 Melanoma Awareness Bracelet – Bangle style bracelet with “Hope For The Cure” bangle. There are several different types of skin cancer. Some are quite common and easy to treat, but others are more aggressive and dangerous. Melanoma is more likely to grow and spread. A new spot on your skin, or a spot that’s changing in size, shape or color may be a warning sign of Melanoma. You can find more information about Melanoma from the American Cancer Society. 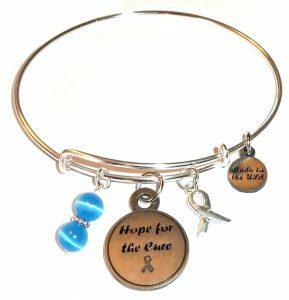 Colon Cancer Awareness Bangle Bracelet – Show your support in style. This is a beautiful colon cancer awareness bangle bracelet that can be used in fundraising, cancer awareness campaigns, or to show your support. 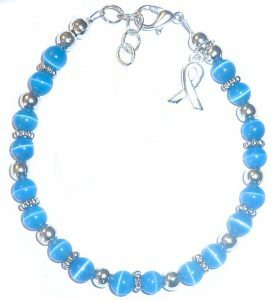 Colon Cancer Awareness Bracelet – Show your support for the fight against colon cancer. 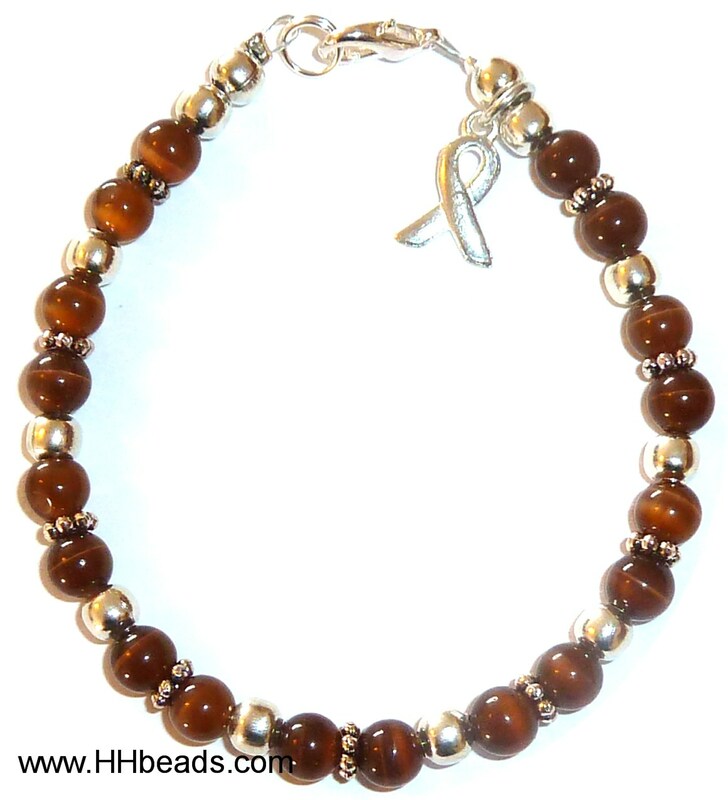 Brown is an alternative color used, sometimes, for colorectal cancer awareness. It is also more popularly used as an Anti-Tobacco Awareness statement. Tobacco use is known to increase the likelihood of developing nearly every kind of cancer. Stopping using tobacco, at any point, increases health and decreases the likelihood of a cancer diagnosis. For help in stopping using tobacco, please visit Be Tobacco Free. Pancreatic cancer is sometimes called the silent disease as it rarely shows early symptoms and presents non-specific later symptoms. Symptoms of pancreatic cancer include pain in the upper abdomen, a yellowing or “jaundice” of the skin, a loss of appetite, nausea, and vomiting, weight loss and weakness, and changes in stool. Diet and obesity, as well as tobacco use, are considered to be risk factors for pancreatic cancer. Heavy alcohol consumption is also a known risk factor. Pancreatic awareness campaigns can help the ones we love make lifestyle changes that will reduce their risk of developing this deadly disease. Click here for more information on pancreatic cancer. Lavender bracelet for Epilepsy Awareness and Cancer Survivors. 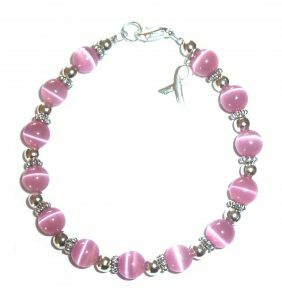 Show your support with this lovely lavender bracelet.